Lynn, with all due respect, the tragedy is these boys got railroaded at every step of the way and the media was happy to support their presumption of guilt based on their skin color. The tragedy is that even to this day, people insist on smearing their character as men. The tragedy is that even when Black and brown people are completely innocent, there is a presumption of guilt. The tragedy is that most of the people in this world still won’t believe the lesson this whole thing teaches us. Crime is not based on skin color and cops are not here to protect or serve children of color from poor communities. I applaud the men I have come to know a bit. In spite of all the harm our racist system inflicted on these kids, they became pillars of society and great role models. The system took their youth, but never their integrity. Can’t wait until all the files are unsealed. Justice for the Central Park Five. Justice for all. FreidaPeople Stat posts regularly on Facebook and I and many, many others consider her opinions pretty much Gospel. Wednesday, May 1, 2013, 12:31 p.m. I got an email from Envoy reporter Sophie Simon who wanted to interview me about the call I put out for a boycott of the Aronson Awards. She was fed, according to her email, bogus information (of course) which she accepted as gospel (of course). The Hunts Point Express on Editorial Alert? An URL of the previous blog below (The Slippery Ethical Slope of the Hunts Point Express) was posted Monday on the The Hunts Point Express facebook page. Lo and behold, it was no longer there yesterday. In fact, the The Hunts Point Express on online is not accepting comments either. Uh Oh! The plot thickens. The Slippery Ethical Slope for the Hunts Point Express? D:F/M has been in a state of academic stasis for years and years but in recent years Colleagues have resorted to all manner of fabrications to cover up its failings. What follows reveals a venial sin/omission compared to a mortal sin/omission (catechism from Catholic schools still resonates slightly). It also could be merely a mistake. 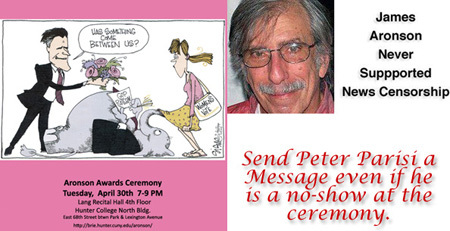 Send Peter Parisi a message so that James Aronson can stop turning over in his grave.